The Blas F. Ople Policy Center and Training Institute is now offering language courses as part of its “Skills for Jobs” program to enhance the core competencies of aspiring overseas Filipino workers including seafarers as well as local job applicants. The policy center is a non-stock, non-profit organization that provides assistance to distressed overseas Filipino workers and also serves as a resource center for labor migration concerns and policies. It also provides communications, leadership, and financial literacy seminars and writing workshops for OFWs and their families. 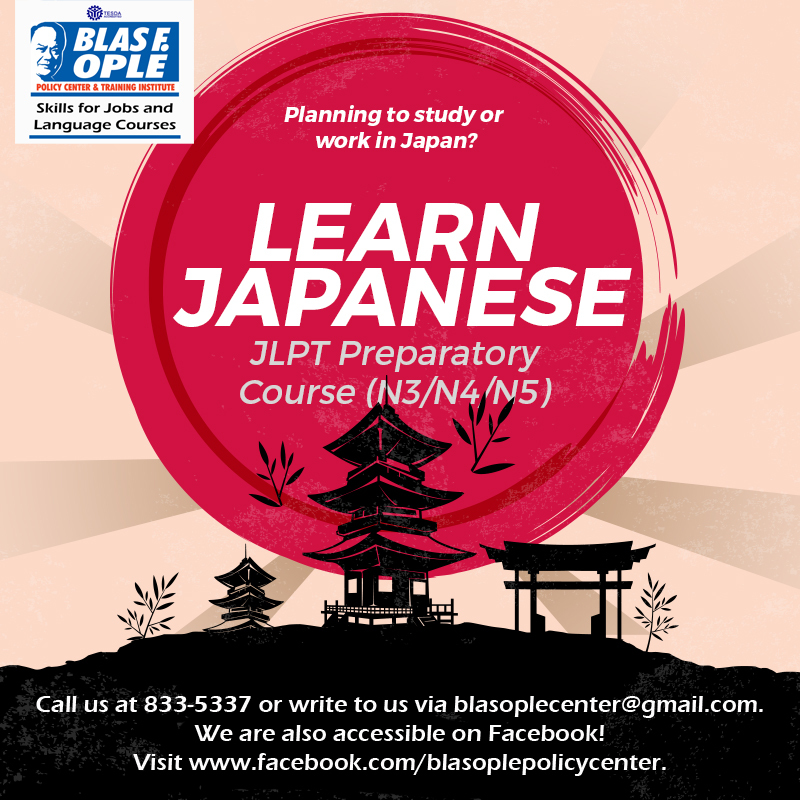 Beginning March 5, the Ople Center will be offering basic and intensive Japanese language courses to be taught by proficient Japanese language teachers who have passed the N-5 language proficiency exams. Isabelita Robles, who recently retired from the Philippine Senate as committee secretary and is now also teaching public policy at the Pamantasan ng Lungsod ng Maynila (PLM) for the President Ramon Magsaysay School of Government, will handle the English classes of the Ople Center. “Considering the increasing number of job opportunities in Japan and China for English teachers and caregivers as well as other skilled workers, we believe that mastering a second or third language is a wise investment,” Susan Ople, president of the training institute said. To make it easier for professionals and working students to avail of their language training programs, the Ople Center has evening and weekend classes for its students. It also has an installment payment program to make the learning fees more affordable and convenient for enrollees. “Our desire to go into language training ties in perfectly with our aspiration towards safe migration and decent work. The best protection for an aspiring OFW is the skills that he or she possesses and chief among such skills is the ability to communicate as well as to comprehend,” Ople added. To make it more fun for language learners, the Ople Center has chosen to incorporate pop culture in the curriculum to include J-Pop songs and Anime, as well as popular English sitcoms and movies for those enrolling in its English proficiency classes. The Center will also be offering free career advice to its graduates to ensure that they won’t fall victim to illegal recruiters and human traffickers. “We want our students to feel at home and secure, knowing that the Ople Center is committed to quality language education and that we will be there for them beyond graduation day,” Ople said. The Ople Center ‘s “Skills for Jobs Program” can be contacted through 833-5337 and via e-mail through [email protected] The Ople Center’s Facebook account is www.facebook.com/blasoplepolicycenter.